Why the Olympics have reignited my flame. Why fix what isn’t broken ? When you write for a living it gets to a point where you are almost on auto-pilot. You know what you’re going to write about, how many words you need and how to fill the space . Every once in a while something happens that brings it all together and makes the picture clearer. How you hold on to that is the important thing. My first memory of the Olympics is watching the Swimming from Barcelona in 1992. I can’t remember the event and I didn’t understand the spectacle that was in front of me, let alone how much it was going to shape my life in the future. in 2000, I like nearly every other Australian was captivated by what was for many of us our first (and last) home Olympics. From Cathy lighting the flame to Jane Saville’s disqualification in the last 500m of the 20km walk on the final day of the Games, it was two weeks crammed with memories that will never be forgotten. Flash forward twelve years and I’m looking at the Olympics in a completely different light. Given my current profession, it’s tough for me not to see things from a media perspective and the Olympics for us, just as it is for the athletes competing, is the absolute pinnacle of the industry. The fact that I don’t have Foxtel means that I haven’t been able to see how well their multi-channel platform is being used, but from all reports it’s offering a complete service, much broader than their FTA counterparts. I have previously written about watching the Olympics on the cheap , something I have been more than happy to do. While Nine haven’t timed some things well, they have the idea right and should they get the rights to Rio 2016 I expect big things. The coverage that has received little attention is that of ABC Grandstand. For my entire life I’ve been a Grandstand tragic, often having footy on in the afternoons while I would play in the backyard as a kid. The amount of moments I have heard through Grandstand and not seen on the screen is a long list, and in many cases Grandstand have provided coverage that has been able to spark my imagination in ways that over coverage hasn’t. This Olympics have again proven to be no different, with the ABC Radio iPhone proving to be a godsend for me when it comes to how much coverage I can take in. The usual pattern has been watch as much as I can on Channel Nine, before putting the iPhone app on and listening to at least another half an hour before I fall asleep. In that time, it’s like going back to the days when radio was the primary source of information. When it comes to broadcasting sport, radio has always been the tougher medium than television, because you are responsible for not only getting the action to the listener but painting a picture of what surrounds you. From experience I can attest to how difficult it is to do, especially when many of the commentators are going to be covering sports they’ve never covered before. With the ABC sending all of their full-time Grandstand staff to cover the Games, it is easy to see why they have been the source of inspiration of late. I grew up as an ABC admirer and even though my love affair with radio has at times waned the respect for what can be produced has not. What they have done in London goes to show sometimes the best way to do something is also the simplest. There hasn’t been one specific moment that has set everything in place, yet watching and listening to the stories that are being told of the athletes coming from nowhere to medals, not about how much sleep James Magnussen is or isn’t getting, has really put some perspective on why I love what I do. It isn’t about using fancy words or asking the obvious questions because you have to, it’s about both the passion and desire needed to tell a good story. When it comes to sport this is something that I know I have in spades. While it sounds cliché the Olympics is the Charlie and the Chocolate Factory of sport, and to quote said film “There is no life I know to compare with pure imagination.” Sport lends us a chance to use that imagination, to see the outcome we want, to dream of that feeling we’ve never experienced, even if it is beyond the realms of possibility. Sport on the radio it to another level as you are responsible for how you want to see the reality. Sometimes you don’t need to be lost to find what you’re looking for, so do yourself a favour by tuning into the ABC’s coverage over the next week. Following the Olympics ABC TV will be covering the Paralympics. Given the commitment and standard they have set with previous Paralympics London is set up to be a huge success with live coverage of both the Opening and Closing Ceremonies, a one-hour highlights package nightly and live coverage from 4-8.30am daily. Who is the greatest Olympian ever ? 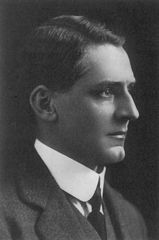 Edwin Flack – The original “Greatest ever Olympian”. Some time ago, 116 years ago in fact, a man called Edwin Flack made his way to Athens for the first modern Olympic Games. Competing in the 800m, 1500m, marathon and singles and doubles tennis, winning Gold in the 800 and 1500 both athletic events and finishing third in the Doubles (Bronze medals were not awarded in 1896). Flack was the first of ten athletes in the history of the modern games to have won medals in two sports, meaning that on average this is an achievement that happens once every three Olympics. What makes this achievement more special was that he took a month off work to travel to the Games, something that many modern-day athletes don’t have to worry about with their endorsement deals. What about Mark Spitz ? I hear you saying “Phelps won eight Gold in 2008, so he is better than Spitz”. We might have to agree to disagree on that one. Quantity doesn’t always beat quality and Spitz swum at a time when the Soviet nations were rising to prominence in the water. The technology available to Spitz was far different, with fast suits a thing of the future. Does it matter how many medals are won as to how great an Olympian you are ? I don’t think it does, and the whole concept of “greatest ever Olympian” is nothing more than a debate for the sake of debating. Phelps is a great athlete, certainly the best Swimmer I’ve ever seen, but ten years ago we weren’t ever going to see anyone better than Ian Thorpe. Greatness comes down to how you want to perceive it and whether you like it or not, it’s nigh on impossible to compare athletes who are never going to have the chance to race each other (not that I wouldn’t want to see Spitz and Phelps go at it). Rather than continuing what is a fun yet tiring debate, people should look at the real answer. There isn’t ever going to be a greatest Olympian, especially given an Olympian is something you are forever, it doesn’t stop once the games are over. Johnny Weissmuller was a multiple sport Gold Medallist who played Tarzan in the 1932 hit Tarzan the ape man, surely a case can be made for him ? Another fact that is all too often forgotten as that we’ll never know or remember the names of 95% of the athletes who compete in any given Olympics, because for them being an Olympian is success enough. In saying that, I’d love to know who you think the greatest Olympian of all-time is, because who doesn’t enjoy weighing in on this debate as pointless as it is. Can we focus on sport for a second ? 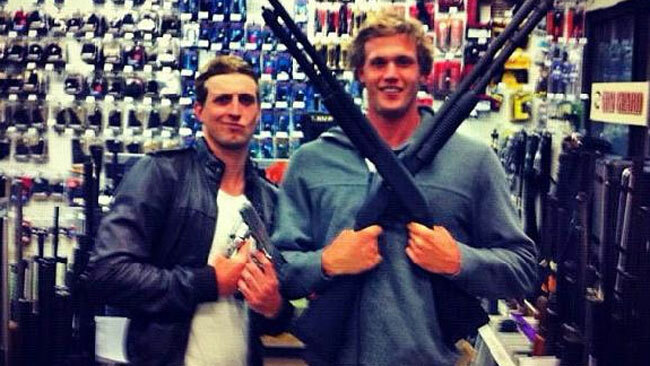 The now famous gun photo featuring Australian Swimmers Nick D’Arcy and Kenrick Monk. The Olympic Games is supposedly the best two-week period every four years for sports fans. Not that’d you’d know it if you lived in Australia during the London Games. If Australians do one thing well besides competing in sport, it’s creating a level of off-field drama to go with it. First it was Stilnox, Nick D’Arcy and Kenrick Monk took photos with some guns, then Natalie Cook chipped in about who should carry the flag and this was all before we’d seen action in London. Since the action kicked off last Friday we’ve seen many of our athletes criticised for only finishing second, Boxer Damien Hooper find himself at the centre of a uniform debate and Rower and rower Josh Booth was arrested and then hospitalised after collapsing in custody. To be honest, I’ve had enough. Athletes supposedly work their whole life to be an Olympian yet some of them are happy to throw it away over absolutely nothing. What’s worse than this is the fact that many fantastic performances are being overlooked, because the majority of the media love a story where someone does something wrong. There is obviously no need to focus on the likes of Christian Sprenger, who came from nowhere to grab Silver, or eighteen year-old Jessica Fox who also won Silver, in the K1 Slalom event and said post race that being at the Olympics let alone winning a medal was beyond her wildest dreams. This is what the Olympics are about, yet more of the focus is being dragged from stories like Fox and Sprenger. Winning is nice, but it isn’t everything. What I would love to see for the last ten days of the Olympics is that the athletes and media who are in London for the Games focus solely on that. Let’s try to make the second week of this sporting christmas what it is intended to be. I want athletes who are proud to wear their colours, journalists who are able to tell a story that most don’t know exist and broadcasters who make me feel like I am right there watching the action unfold. Because that’s what the Olympics is meant to be about.